Now that the French Development Agency has resurrected Kenya’s Meru National Park they are taking on another ambitious project – Marsabit National Park. The mid-1960s book and subsequent movie “Born Free” about Elsa the lioness rescued by George and Joy Adamson, gave Meru National Park fame and tourism fortune, then in the early 1980s, when I first started traveling to Kenya, I personally witnessed the decay of magnificent Meru. Poachers and robbers plagued the park creating massive decline in wildlife and tourism until the French financed a variety of projects to revive the park. My next blog will be all about what happened in Meru. Marsabit’s issues are endangered wildlife, and lush forests at risk from burning and timber usage. Per the Kenya Wildlife Service, studies are being conducted to determine funding needs. I suspect the one lodge in the area will be renovated even though the park has never been a huge tourist destination. I’ve never had the opportunity to visit Marsabit during my off time, because I was told never to travel north alone. The park has always been portrayed as unsafe and out of reach since security in the area is tenuous and roads treacherous. It’s also in the Northern Frontier, close to the Ethiopian border where tribes are not exactly friendly. Those are pretty good reasons why the park is not on the usual safari itinerary, but considering it’s the epitome of elephant habitat and a verdant mountain paradise with historical significance, it’s sad indeed. If the mountain could share secrets, tales would be told of the time during the 1920s when Martin and Osa Johnson, American filmmakers and adventurers, lived at the edge of Lake Paradise filming their first elephant documentary “Wanderings of an Elephant” for the silver screen. The film was renamed “Trailing African Wild Animals” and eventually released. Their books and some movies can be found at the Martin and Osa Johnson Safari Museum. 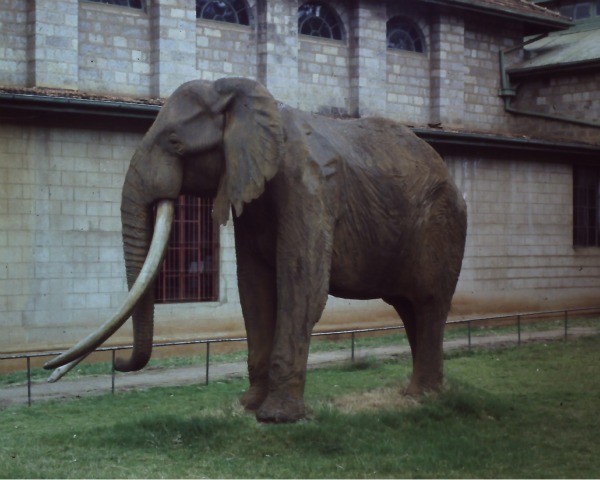 Another famous resident was Ahmed, elephant king of Marsabit. He was so laden with mammoth tusks that President Jomo Kenyatta declared him a national treasure, officially protecting him from poachers with a 24/7 security detail until his death in 1974 from natural causes. With such a fascinating past and promising future, Marsabit is high on my list of intriguing places to visit. I can’t wait! This entry was posted in National Parks and tagged Ahmed, Marsabit, Meru, Osa and Martin Johnson. Bookmark the permalink.